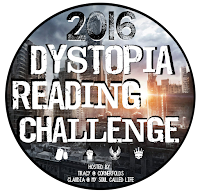 Welcome to the second month of the 2016 Dystopia Reading Challenge! I hope everyone has met all their January goals! If you're new to the challenge, you can see the guidelines and sign up here! Link up your February book reviews under "Review Link-up" and link up your discussion post under "Discussion Prompt Link-up" as follows: Name of book @ Your blog name, Goodreads, Shelfari, Booklikes, etc.